People sometimes ask me when I will teach my network forensics class in the United States. The US is undoubtedly the country with the most advanced and mature DFIR community, so it would be awesome to be able to give my class there. However, not being a U.S. person and not working for a U.S. company makes it rather difficult for me to teach in the United States (remember what happened to Halvar Flake?). So if you’re from the Americas and would like to take my network forensics class, then please don’t wait for me to teach my class at a venue close to you – because I probably won’t. 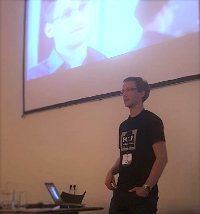 My recommendation is that you instead attend my upcoming training at 44CON in London this September. The first day of training will focus on analysis using only open source tools. The second day will primarily cover training on commercial software from Netresec, i.e. 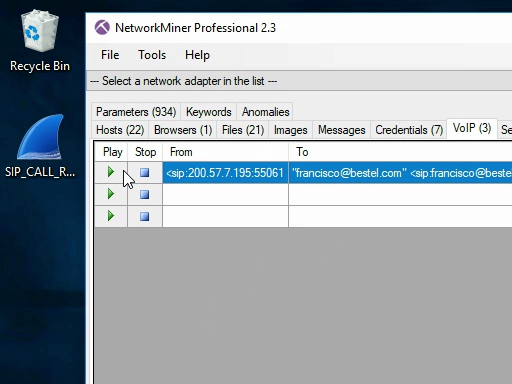 NetworkMiner Professional and CapLoader. All students enrolling in the class will get a full 6 month license for both these commercial tools. 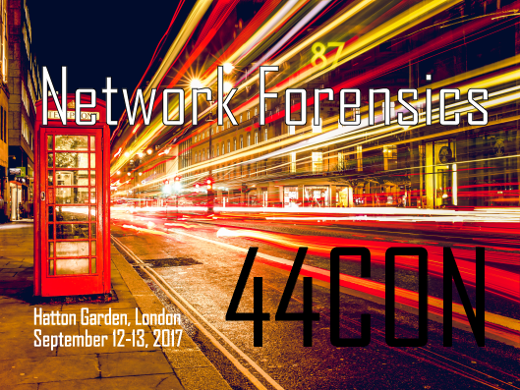 Hope to see you at the 44CON training in London! NSA's QUANTUM INSERT attack is probably the most well-known TCP packet injection attack due to the Snowden revelations regarding how GCHQ used this method to hack into Belgacom. However, the “Five Eyes” are not the only ones who perform this type of attack on the Internet. We now release a tool to help incident responders to find these types of packet injection attacks. I had the opportunity to attend and present at SharkFest Europe last week. My presentation, titled “Dissecting Man-on-the-Side Attacks”, showed how TCP packet injection attacks can be analyzed if they have been recorded in a packet capture. In my talk I used a python script called “finject.py”, which reads PCAP files to find TCP packets with duplicate sequence numbers but different content. This script has previously only been shared with vetted parties, but as of my SharkFest presentation findject is now freely available for everyone. 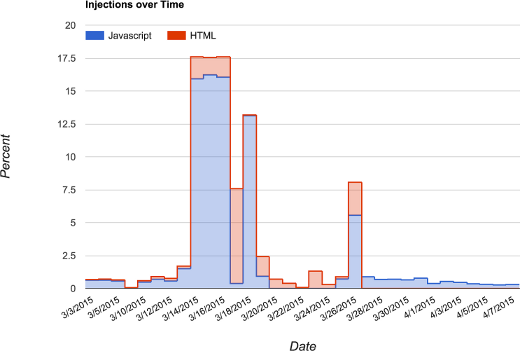 Findject is not the first tool made available to detect TCP content injection attacks. Other detection methods include Suricata's reassembly_overlap_different_data alert, Fox-IT's Bro policy to check for inconsistencies in the first packet with payload, David Stainton's HoneyBadger and Martin Bruse's qisniff. Even though these are all great solutions we found that some of them didn't detect all TCP content injection attacks while others gave too many false positives. 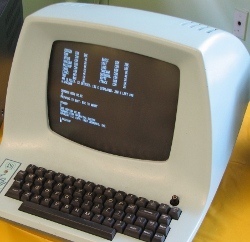 We also wanted to have a tool that was fast, portable and simple to use. This led us to create our own TCP injection detection tool. In the example execution above we can see that findject.py detected an injected TCP packet in the file ppp0.150923_081337.pcap, while the other analyzed files contained no injections. 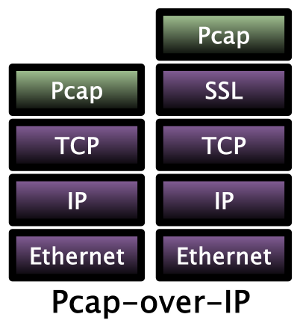 The application layer data of the two conflicting TCP segments are printed to standard output with a header indicating whether the segment was the FIRST or LAST one. To find out which segment is the real one and which was the injected one we need to open the PCAP file in either Wireshark, tshark or CapLoader. tshark -r /nsm/pcap/live/ppp0.150923_083317.pcap -Y "ip.src eq 42.96.141.35 and tcp.port eq 59320" -T fields -e frame.number -e ip.src -e ip.dst -e tcp.seq -e tcp.len -e ip.id -e ip.ttl -o "tcp.relative_sequence_numbers: false"
The tshark execution above reveals that three packets sent from the web server's IP (42.96.141.35) are carrying data and have the same sequence number (402877220). Packet 25 and 27 are actually identical, while packet 28 is smaller (170 bytes) and has a different payload. The first displayed frame in the tshark output above is the SYN+ACK packet from the TCP 3-way handshake. So how can we determine which of packets 25, 27 and 28 are real verses injected? Look at the IP-ID and IP-TTL values! Frame 28 has IP-ID and TTL values in line with what we see in the TCP 3-way handshake (TTL=94, IP-ID=0x00002e3e), which implies that this packet is probably authentic. Frames 25 and 27 on the other hand deviate from what we would expect from the server, which tells us that these packets were likely injected (spoofed) into the TCP session through a “man-on-the-side” attack. Example captures containing TCP content injection attacks can be found on our Publicly Available PCAP Files page under the “Packet Injection Attacks / Man-on-the-Side Attacks” section. You can also read our blog posts Covert Man-on-the-Side Attacks and Packet Injection Attacks in the Wild to learn more about TCP packet injection attacks. 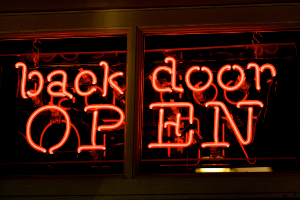 As of today we officially launch the 'Netresec Bug Bounty Program'. Unfortunately we don't have the financial muscles of Microsoft, Facebook or Google, so instead of money we'll be giving away t-shirts. Be able to reliably crash the latest version of NetworkMiner or CapLoader, or at least make the tool misbehave in some exceptional way. Send a PCAP file that can be used to trigger the bug to info[at]netresec.com. Those who find bugs will also receive an honorable mention in our blog post covering the release of the new version containing the bug fix. Additionally, submissions that play a key-role in mitigating high-severity security vulnerabilities or addressing very important bugs will be awarded with a free license of either NetworkMiner Professional or the full commercial version of CapLoader. 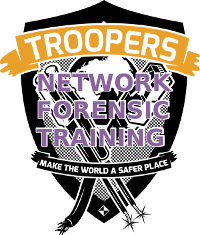 I'm happy to announce that I will teach a two-day Network Forensics class at the upcoming Troopers conference in March! The first day of training (March 14) will cover how to use open source tools to analyze intrusions and malware in captured network traffic. On day two (March 15) I will show attendees some tips and tricks for how to use software developed by us at Netresec, i.e. 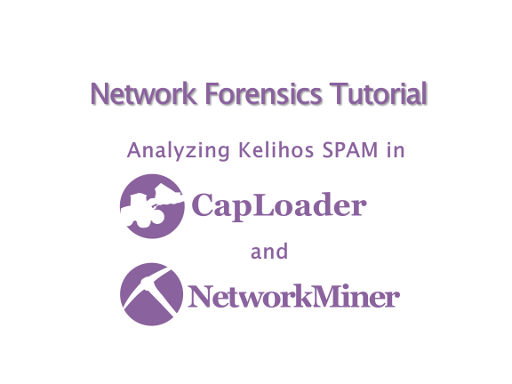 NetworkMiner Professional and CapLoader. This training is a rare opportunity to learn how to use this software directly from the main developer (me). Everyone taking the class will also get a free 6 month personal license for both NetworkMiner Pro and CapLoader. 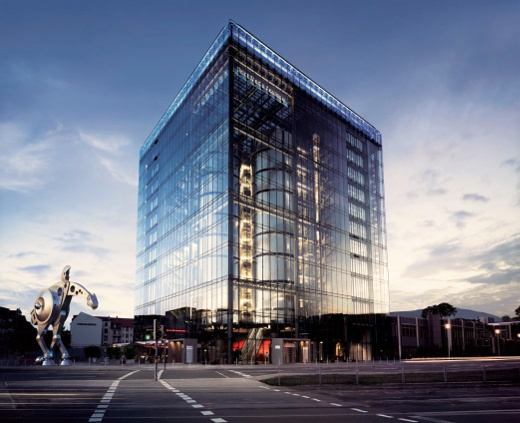 Hope to see you at TROOPERS16 in Heidelberg, Germany! We have looked closer at this attack and can conclude that China is using their active and passive network infrastructure in order to perform a packet injection attack, known as a man-on-the-side attack against GitHub. See our "TTL analysis" at the end of this blog post to see how we know this is a Man-on-the-side attack. The script got our browser to connect to github.com (IP address 192.30.252. [128-131]) in an infinite loop. As can be seen in the code, the two targeted URLs are github.com/greatfire and github.com/cn-nytimes, which are mirror sites for GreatFire.org and the Chinese New York Times. GreatFire and NYT both use GitHub to circumvent the online censorship performed by the Great Firewall of China (GFW). Time-To-Live (TTL) analysis is a powerful method that can be used in order to analyze Man-in-the-Middle as well as Man-on-the-Side attacks. 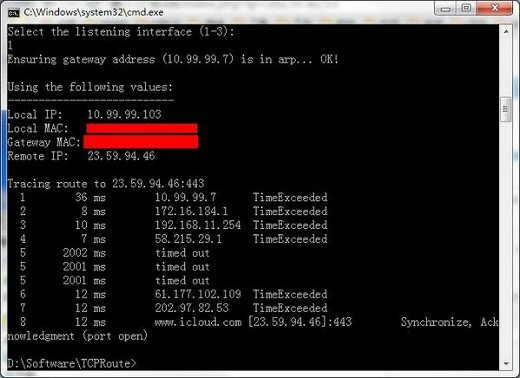 We've used this method before when analyzing the Chinese MITM attacks on iCloud, Yahoo, Google and GitHub. Notice how the TTL of the SYN+ACK packet from the server is 42, while the three injected packets with payload have TTL values of 227, 228 and 229? The server's SYN+ACK packet stays at an IP TTL of 42 pretty much throughout our whole analysis, but the TTL of packets carrying the malicious payload varied between 30 and 229. This behavior implies that the SYN+ACK packet we are seeing is coming from the actual Baidu server, while the packets carrying the malicious payload are injected somewhere else. This attack demonstrates how the vast passive and active network filtering infrastructure in China, known as the Great Firewall of China or "GFW", can be used in order to perform powerful DDoS attacks. Hence, the GFW cannot be considered just a technology for inspecting and censoring the Internet traffic of Chinese citizens, but also a platform for conducting DDoS attacks against targets world wide with help of innocent users visiting Chinese websites. Using my custom http-traceroute, I've proven that the man-in-the-middle machine attacking GitHub is located on or near the Great Firewall of China. While many explanations are possible, such as hackers breaking into these machines, the overwhelmingly most likely suspect for the source of the GitHub attacks is the Chinese government. The packets injected by the [Great Cannon] also have the same peculiar TTL side-channel as those injected by the GFW, suggesting that both the GFW and the GC likely share some common code. For more details on the TTL side-channel of the GFW, please read the Usenix FOCI '14 paper Towards a Comprehensive Picture of the Great Firewall’s DNS Censorship. [T]he shared source code and co-location between the GFW and GC suggest that the GC could have been developed within the same institutional framework as the GFW. For 115.239.210.141, the GFW and the GC both exist between hop 12 and 13, on the link between 144.232.12.211 and 202.97.33.37, as the traffic enters China Telecom. For 123.125.65.120, the GFW and GC both exist between hop 17 and 18, on the link between 219.158.101.61 and 219.158.101.49, belonging to China Unicom. This confirms that the GC is located within the same ASN's as where we've previously seen the GFW perform SSL MITM attacks, which is in AS4134 (China Telecom) and AS4837 (China Unicom). If you would like to learn how to detect and analyze man-on-the-side attacks, then we recommend that you sign up for our two-day Network Forensics Class. 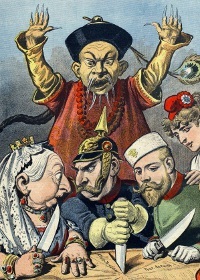 We were contacted by GreatFire.org earlier today regarding a new Chinese man-in-the-middle (MITM) attack. This time the perpetrators decrypted traffic between Chinese users and Microsoft's IMAP mail server for outlook.com. As evidence GreatFire.org provided us with a packet capture file, which we have analyzed. Our conclusion is that this was a real attack on Microsoft's email service. Additionally, the attack is very similar to previous nationwide Chinese attacks on SSL encrypted traffic, such as the attack on Google a few months ago. Details such as email address, email password, email contents, email attachments and contacts may have been compromised in this attack. We do not know the scale of the attack, it could be anything from a fairly targeted attack to a nation wide attack in China. 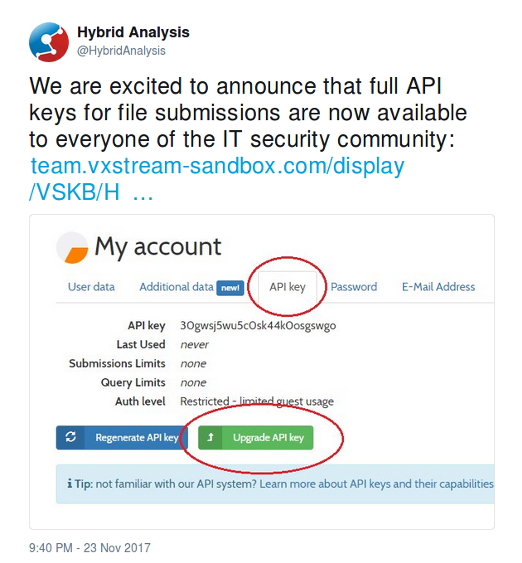 What we do know is that there are several users who have been subjected to the MITM attack and posted screenshots online. In our technical analysis we first extracted the x509 certificates from the SSL traffic by loading the capture file into NetworkMinerCLI. We then parsed the extracted certificates with OpenSSL. 84 frames parsed in 0.888754 seconds. When looking at the timestamps in the capture file we noticed that the SSL server's reply to the 'Client Hello' was very slow; response times varied between 14 and 20 seconds. Under normal circumstances the 'Server Hello' arrives within 0.3 seconds after the 'Client Hello' has been sent. This is slow SSL response is consistent with previous SSL MITM attacks conducted with support of the Great Firewall of China (GFW). For more details on this attack, please see the Reuters story "After Gmail blocked in China, Microsoft's Outlook hacked" and GreatFire's own blog post "Outlook grim - Chinese authorities attack Microsoft". We've released version 1.6 of NetworkMiner today! Reassembled files and images can be opened with external tools by drag-and-dropping items from NetworkMiner's Files or Images tabs onto your favorite editor or viewer. Improved extraction of emails and attachments sent over SMTP. Failed DNS lookups that result in NXDOMAIN and SERVFAIL are displayed in the DNS tab along with the flags in the DNS response. 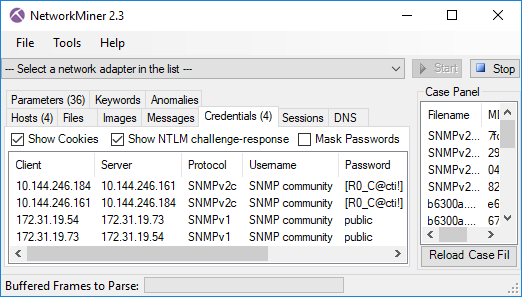 Remote live sniffing enabled by bringing the PCAP-over-IP feature into the free open source version of NetworkMiner. Note the NXDOMAIN responses and “No” in Alexa top 1 million column in the screenshot above; these domains are probably generated by a domain generation algorithm (DGA). For more information about how to run NetworkMiner in Linux, please read our HowTo install NetworkMiner in Ubuntu Fedora and Arch Linux blog post. 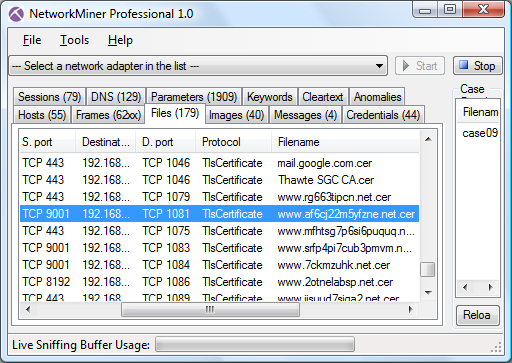 To receive the Pcap-over-IP stream in NetworkMiner, simply press Ctrl+R and select a TCP port. For more information about this feature please see our previous blog post about the PCAP‑over‑IP feature. The TCP ports 25 and 587, which are used in the capture filter above, are the standard port numbers for SMTP. In order to do live extraction of files sent over HTTP, simply use “port 80” as capture filter instead. Likewise, X.509 certificates can also be extracted from HTTPS sessions simply by using “port 443” as capture filter. The most recent release of the free (open source) version of NetworkMiner can be downloaded from SourceForge or our NetworkMiner product page. Paying customers can download an update for NetworkMiner Professional from our customer portal. We would like to thank Dan Eriksson (FM CERT) and Lenny Hansson (Danish GovCERT) for submitting bug reports and feature requests. 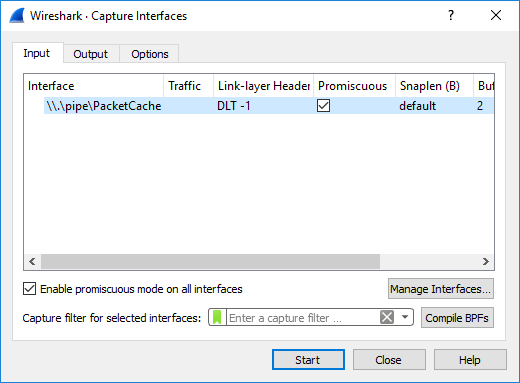 A new feature in the recently released CapLoader 1.2 is the ability to carve network packets from any file and save them in the PCAP-NG format. 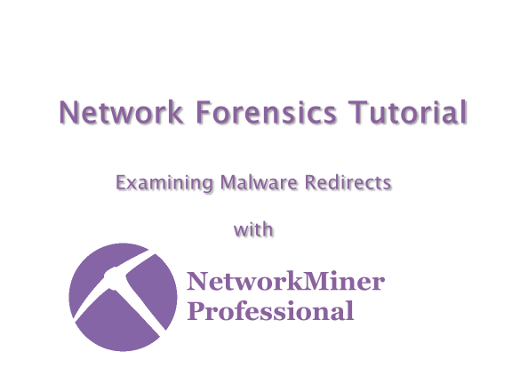 This fusion between memory forensics and network forensics makes it possible to extract sent and received IP frames, with complete payload, from RAM dumps as well as from raw disk images. CapLoader will basically carve any TCP or UDP packet that is preceded by an IP frame (both IPv4 and IPv6 are supported), and believe me; there are quite a few such packets in a normal memory image! We've made the packet carver feature available in the free version of CapLoader, so feel free to give it a try! The packet carving feature makes it possible do much better analysis of network traffic in memory dumps compared to Volatility's connscan2. With Volatility you basically get the IP addresses and port numbers that communicated, but with CapLoader's packet carver you also get the contents of the communication! I loaded the publicly available “Banking Troubles” memory image from the Honeynet Project into CapLoader to exemplify the packet carver's usefulness in a digital forensics / incident response (DFIR) scenario. python volatility connscan2 -f images/hn_forensics.vmem"
"This connection [marked in bold above] was opened by AcroRd32.exe (PID 1752) and this represents an additional clue that an Adobe Reader exploit was used in order to download and execute a malware sample." The solution doesn't provide any evidence regarding what Acrobat Reader actually used the TCP connection for. Additionally, none of the three finalists managed to prove what was sent over this connection. To view the payload of this TCP connection in CapLoader, I simply right-clicked the corresponding row and selected “Flow Transcript”. Notice that the HTTP GET request took place at the end of the TCP session. Odd? Well, CapLoader doesn't know the timestamp of carved packets, so they are simply ordered as they were discovered in the dump file. The timestamp generated for each carved packet represents where in the image/dump the packet was found. Or more precise: the number of microseconds since EPOCH (1970-01-01 00:00:00) is the offset (in bytes) from where the packet was carved. Hence, we know that the HTTP GET request can be found between offset 37068800 and 37507072 in the image (a 428 kB region). To be more exact we can open the generated PcapNG file with Wireshark or Tshark to get the timestamp and length of the actual HTTP GET request packet. Now, lets verify that the raw packet data is actually 37462016 bytes into the memory dump. 23ba000: 0021 9101 b248 000c 2920 d71e 0800 4500 .!...H..) ....E.
23ba020: a4cb 049a 0050 7799 0550 f33b 7886 5018 .....Pw..P.;x.P. 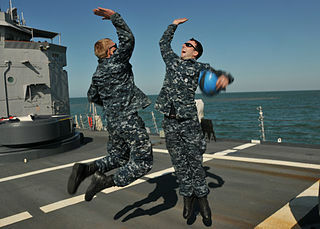 23ba030: faf0 227e 0000 4745 5420 2f6c 6f61 642e .."~..GET /load. 23ba060: 3036 2e30 2665 3d32 2048 5454 502f 312e 06.0&e=2 HTTP/1. 23ba070: 310d 0a41 6363 6570 743a 202a 2f2a 0d0a 1..Accept: */*..
23ba090: 2067 7a69 702c 2064 6566 6c61 7465 0d0a gzip, deflate..
Yep, that's our HTTP GET packet preceded by an Ethernet, IP and TCP header. Download the free RAM dumper DumpIt and dump your own computer's memory. 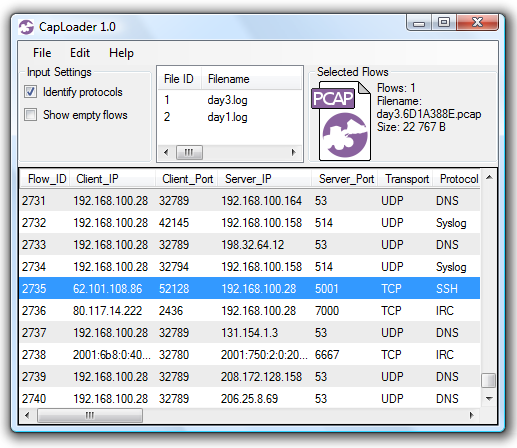 Download the free version of CapLoader and open the memory dump. Select destination for the generated PcapNG file with carved packets and hit the “Carve” button! 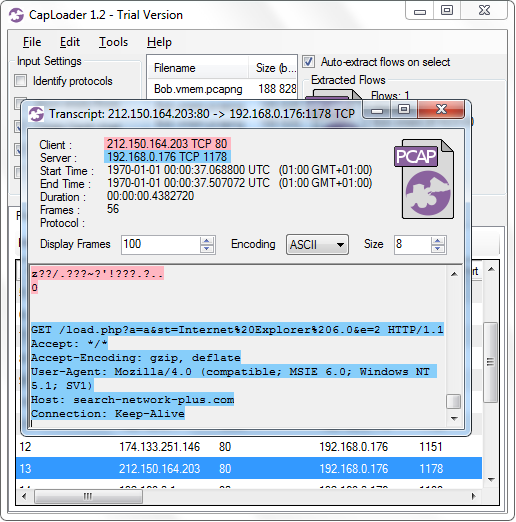 CapLoader can parse PCAP and PcapNG files, which are the two most widely used packet capture formats. However, the packet carving features makes it possible to extract packets from pretty much any capture format, including proprietary ones. The drawback is that timestamp information will be lost. .ETL files created with netsh or logman. These Event Trace Log files can be created without having WinPcap installed. @StopMalvertisin recently published a great blog post that covered the five binaries that were served with help of the PHP.net compromise. We've therefore updated this blog post with a few of their findings in order to give a more complete picture of the events. 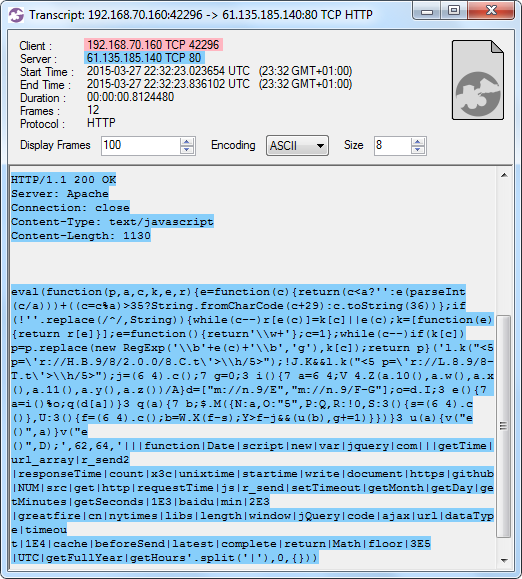 The good people from Barracuda Labs were kind enough to share a PCAP file from the PHP.net compromize on their blog. 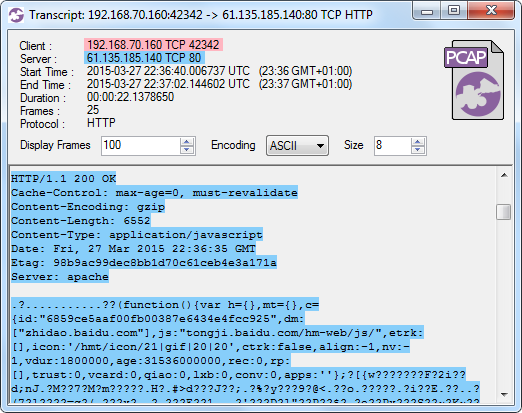 I decided to have a closer look at that PCAP file to see what can be extracted from it. Since the PCAP contains Windows malware I played safe and did all the analysis on a Linux machine with no Internet connectivity. We can see that the PCAP is from October 22, i.e. the traffic was captured at least one day before Google Safe Browsing started alerting users that PHP.net was hosting malware. Barracuda Labs made the PCAP file public on October 24. Several of these hostnames look suspicious; two of them look as if they have been produced by a domain generation algorithm (DGA). However, before proceeding with analyzing these domains I'll also run the PCAP through httpry in order to generate a web-proxy-like log. We can see that the first HTTP request outside of php.net was a GET reguest for url.whichusb.co.uk/stat.htm. Let's extract this file (and all the other ones) to disk with NetworkMinerCLI, i.e. the command line version of NetworkMiner Professional. NetworkMinerCLI works just fine in Linux (if you have installed Mono) and it's perfect when you wanna automize content extraction from PCAP files, since you can script it to extract metadata and files to disk from the captured packets. NetworkMinerCLI has now produced multiple CSV files that we can grep in (or load into Excel / OpenOffice). 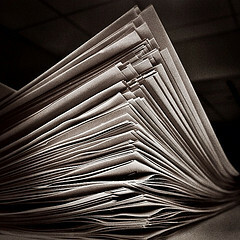 The “AssembledFiles” directory contains the files that have been extracted from the packets. 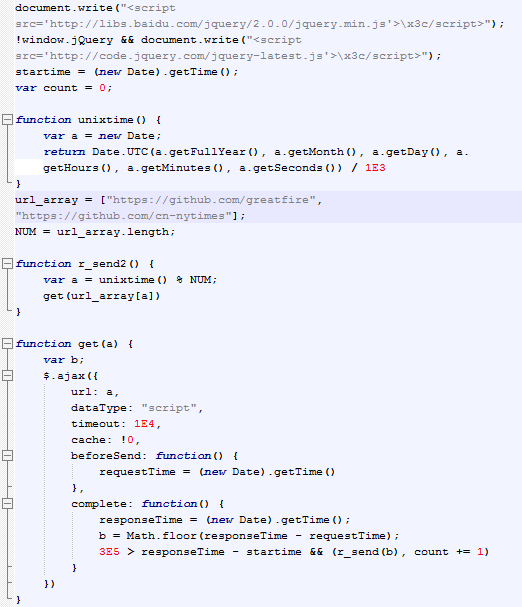 The bold part of this java script does a HTTP POST back to stat.htm with a parameter named id and a value in the following format: "ScreenResolutionWidth|Java(1/0)|AdobeReader(1/0)"
The Parameters.csv contains all text based variables and parameters that have been extracted from the PCAP file. I should therefore be able to find the contents of this HTTP POST inside that CSV file. The first DGA-like URL in the list above was zivvgmyrwy.3razbave.info. Let's proceed by grepping for the DGA hostname and its IP. These are the MD5-sums of the files that have been downloaded from that suspicious domain. The last column (column 10 in the original CSV file) is the file's first four bytes in Hex, followed by an ASCII representation of the same four bytes. Hence, files starting with 4D5A (hex for “MZ”) are typically Windows PE32 binaries. We can see that five PE32 files have been downloaded from 144.76.192.102. All the listed files have also been carved to disk by NetworkMinerCLI. We can therefore have a quick look at the extracted files to see if any of them uses the IsDebuggerPresent function, which is a common anti-debugging technique used by malware to avoid sanboxes and malware analysts. It turns out that the PCAP file contains communication to one of the IP addresses associated with the “uocqiumsciscqaiu.org” domain. The server is located in Russia (according to MaxMind). Going back to our previous httpry log we can see that a HTTP POST was made to this domain. Let's see what content that was pushed out to that Russian server! 0000 0a b4 df 27 c2 b0 00 20 18 eb ca 28 08 00 45 00 ...'... ...(..E.
0020 46 67 04 2f 00 50 d3 80 46 2f e3 c6 b5 b5 50 18 Fg./.P..F/....P.
0080 6e 74 72 6f 6c 3a 20 6e 6f 2d 63 61 63 68 65 0d ntrol: no-cache. 0090 0a 0d 0a 1c 61 37 c4 95 55 9a a0 1c 96 5a 0e e7 ....a7..U....Z..
00d0 f2 62 73 6e ee 37 bc 40 3e 3d 22 0b fe 7c ca 9c .bsn.7.@>="..|.. 00e0 49 39 2b d2 cb a2 ec 02 70 2b 58 de 24 75 61 21 I9+.....p+X.$ua! 00f0 85 c9 91 c1 7a ee 0b f7 fd 6c ef e6 c2 6e cb a9 ....z....l...n..
0100 fb ac 65 d8 78 87 fa e2 7f 05 13 a6 73 3d 27 b1 ..e.x.......s='. That looks quite odd. Most likely C2 communication or some form of encrypted channel for information leakage. Update: Our friends from stopmalvertising.com confirm that this is C2 traffic from the downloaded Trojan with MD5 c73134f67fd261dedbc1b685b49d1fa4. 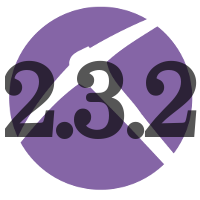 Running the PCAP through Snort will generate multiple alerts indicating that UDP traffic to port 53 might be C2 traffic from the ZeroAccess trojan. Sweet, those IP's are most likely infected with ZeroAccess as well. Barracuda Lab's public IP address for their malware analysis machine seems to be 64.235.155.80. I've created a timeline of the events in the PCAP file provided by Barracuda Labs. This timeline is frame centric, i.e. frame number is used as the first identifier instead of a timestamp. This helps when you wanna find a particular event in the PCAP. 15 Set-Cookie: COUNTRY=USA%2C64.235.155.80 The external IP of Barracuda's malware lab is stored as a cookie. NetworkMiner 1.5 was released on August 7th, but we haven't yet provided any details regarding the new functionality that has been added. DNS tab in NetworkMiner Professional with eee.pcapng from CloudShark loaded. In order to bring up the metadata window, simply right-click a PcapNG file in NetworkMiner's case panel and select "Show Metadata". The extracted metadata will normally contain info about the machine used to create the capture file, such as the OS and what sniffer that was used. Also, please note that some PcapNG files additionally contain name resolution blocks with cached DNS entries even if the corresponding traffic has been filtered from the capture file. We hope you will find these new features useful! NetworkMiner 1.2 is now available! 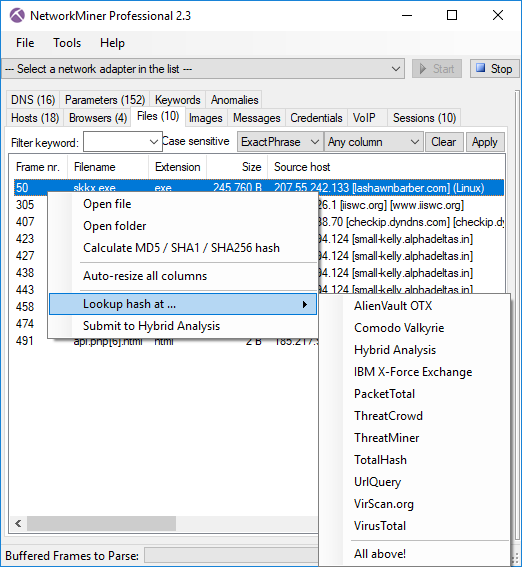 For those who are not familiar with the network forensics tool NetworkMiner, it's a portable Windows application that analyzes network traffic. 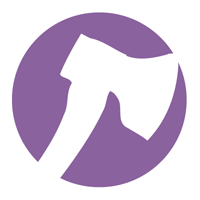 NetworkMiner comes in two flavors; a free open source version and a commercial version called “NetworkMiner Professional”. Updated "Details" column in "Files" tab to display the HTTP host name as well as the URI from where the file was retrieved. We offer free upgrades for users running older versions of NetworkMiner Professional. Just send an email to info [at] netresec.com with your current version number as well as license number (which you can find under the menu “Help” > “About Network Miner”) and say that you'd like to upgrade to version 1.2. The “-f” switch can now be used to force RawCap to immediately flush sniffed packets to disk. I've received multiple emails from RawCap users who run into problems when they want to look at a pcap file from RawCap without terminating the program. What usually happens in this case is that the output pcap file will be empty until they terminate RawCap with “Ctrl-C”. The reason for this is that RawCap has a 1MB data buffer, which is used in order to maximize performance by reducing unnecessary disk operations. RawCap will therefore not write any data to disk until it is terminated or has filled the buffer with 1MB of network traffic. We've now released a new version (1.4.0.0) of RawCap in order to solve the needs of these users. The new version supports WriteThrough, which forces the data to be written directly to disk without being buffered. 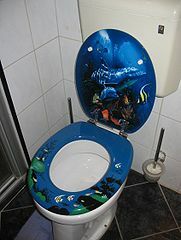 The automatic flushing functionality is enabled by supplying the “-f” switch from the command line when launching RawCap. UPDATE : We no longer recommend running NetworkMiner under Wine, please see our blog post on HowTo install NetworkMiner in Ubuntu Fedora and Arch Linux instead. Joshua Smith has written a great blog post on toastresearch.com about how to get NetworkMiner running on BackTrack Linux. C. S. Lee (a.k.a. geek00l) has also written a blog post a couple of years ago explaining how to install NetworkMiner on Ubuntu Linux. I hope this will help you get NetworkMiner running on your Ubuntu analyst station! We will also be looking into having NetworkMiner fully compatible with mono in a future release. This would allow you to run NetworkMiner “natively” on Linux, Mac OS X as well as BSD (OpenBSD, FreeBSD, NetBSD). We are today very proud to release version 1.1 of NetworkMiner! Extraction of parameters sent to Google Analytics into NetworkMiner's “Host Details”. These parameters include: screen resolution, color depth, browser language and flash version. 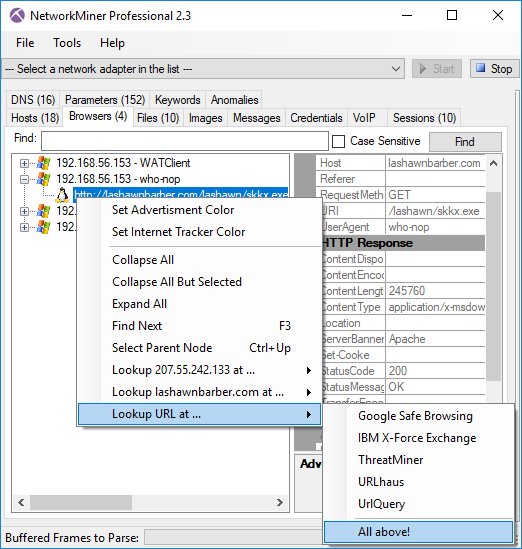 NetworkMiner Professional additionally includes support for Pcap-over-IP, which comes in very handy when you need to access pcap files or network traffic from remote machines or devices. 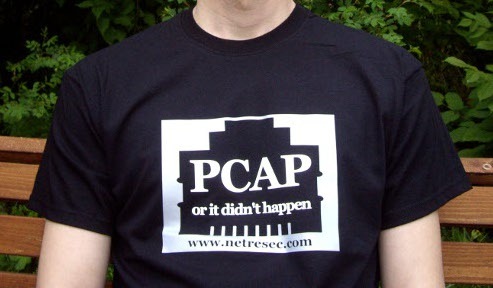 There is, however, no support for Pcap-over-IP in the open source version of NetworkMiner. We offer free upgrades for users of NetworkMiner Professional 1.0. Just send an email to info [at] netresec.com with your license number (which you can find under the menu “Help” > “About Network Miner”) and say that you'd like to upgrade to version 1.1. Version 1.1 of NetworkMiner is soon to be released by us at Netresec. I would therefore like to give you a sneak preview of a simple yet very useful feature that we've added. We call this new feature “Pcap-over-IP”, which is a name originally coined by Packet Forensics. In this example I'd be running NetworkMiner on a PC with IP 192.168.1.20 and have Pcap‑over‑IP listening to TCP port 57012. NetworkMiner will save the received packets to disk as well as parse and display the contents of the packets in the GUI when receiving the Pcap‑over‑IP stream. Note that the “-w -” switch tells dumpcap to push the raw libpcap formated data to standard output (stdout) rather than saving it to a pcap file. The reason for using dumcap to perform the live sniffing rather than using the built in packet capturing functionality of NetworkMiner is that dumpcap is an extremely reliably tool when it comes to capturing packets. So by sniffing with dumpcap instead of NetworkMiner you minimize the risk of dropping some packets. It is even possible to receive multiple PCAP streams simultaneously with NetworkMiner. This way I could have 14 dumpcap or tcpdump processes sniffing each individual IEEE 802.11 channel, while monitoring all the captured traffic in real-time with a single instance of NetworkMiner. However, note that this would require 14 sniffer computers or a single sniffer machine with 14 WiFi cards. With the release of NetworkMiner 1.6 we've made the PCAP‑over‑IP functionality available in the free open source edition of NetworkMiner. We have also integrated PCAP‑over‑IP into NetworkMinerCLI, i.e. 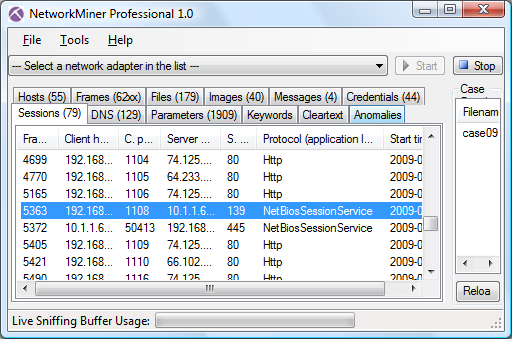 the command line version of NetworkMiner Professional. UPDATE (June 16, 2011): This blog post has been modified in consent with Dr. Simson Garfinkel since the Nitroba case is actively being used in digital forensics classes. The actual solution to the case has now been replaced with hints and clues. I recently received a request to help solve a network forensics case called "Nitroba University Harassment Scenario". I regularly keep track of publicly available pcap files on the Internet, but this one was new to me. I therefore dived in and started analyzing the pcap file. You are a staff member at the Nitroba University Incident Response Team. Lily Tuckrige is teaching chemistry CHEM109 this summer at NSU. Tuckrige has been receiving harassing email at her personal email address. She thinks that it is from one of the students in her class. "To ﬁnd out what's going on, Nitroba's IT sets up a packet sniffer"
Good for us, this means we have some captured packets to analyze with NetworkMiner! While the traffic was being sniffed Lily received a new email, this time with a link to a webpage with a message titled "you can't find us" and the content "and you can't hide from us. Stop teaching. Start running." 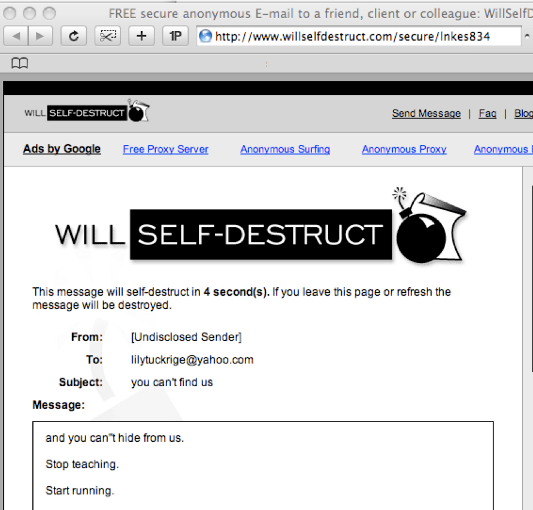 A good starting point is to look for the session where the self-destruct email was being posted to the www.willselfdestruct.com website. One way to do this is to pick a couple of keywords from the message (such as "teaching" and "running") and add them to the Keywords tab of NetworkMiner. You will then have to press the "Reload Case Files" button in order to let NetworkMiner re-parse the nitroba.pcap file while looking for these keywords. Look in the Context column for text that seems to be from the self-destruct message. At what point in time was the self-destruct message sent? 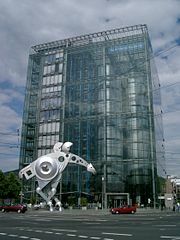 Has the sender's IP address been used by one or several computers? What online services (webmail / social media / instant messaging etc.) has the user of this IP address been logged into? For the last bullet (online services) I recommend that you take a closer look at my Webmail Information Leakage blog to get even more hints. I really enjoyed the Nitroba case, and thought it was a really good training case to be used for educational purposes. Thanks Naval Postgraduate School's Digital Evaluation and Exploitation (DEEP) group for creating this network forensics case! I've released version 1.6 of a tool called SplitCap today. SplitCap is a really fast PCAP file splitter, which can be used to split large pcap files based on for example IP addresses or sessions. You can also use SplitCap in order to filter out traffic to/from specific IP addresses or port numbers from a large pcap file. The best thing about SplitCap is that it is FAST, much faster than the alternatives. The -s switch can be used with arguments flow, host, hostpair or nosplit and tells SplitCap how the frames should be separated into the output pcap files. What I believe is a unique feature of SplitCap is the ability to split a pcap file based on session, i.e. 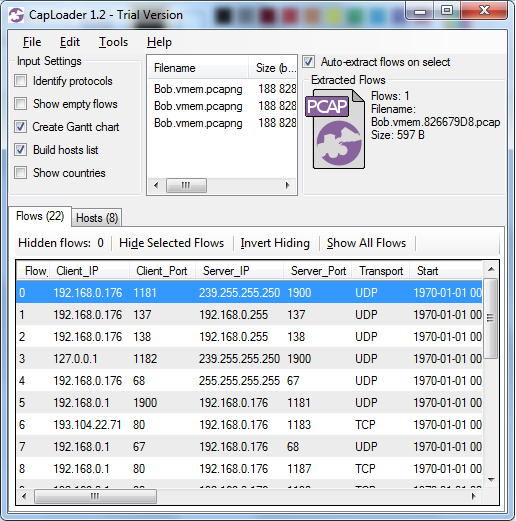 the frames from each TCP or UDP session are placed in a separate pcap file. The session split mode is the default one, but you can also use the -s session argument to tell SplitCap to use the session split mode. 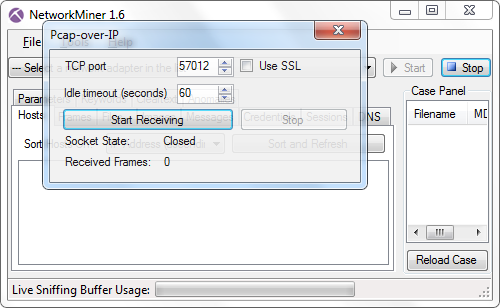 Note that the session parameter tells SplitCap to join frames going both to and from the server into the same pcap file. 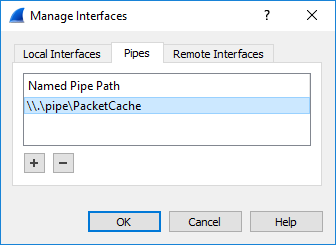 If you instead wanna separate the two directions into separate pcap files, then you can use the -s flow switch. This command creates a file named "huge.pcap.NoSplit.pcap" that only contains the frames going to or from ports 53 and 80. A pretty cool thing with SplitCap is the ability to extract application (i.e. layer 7) data from a pcap file with the -y L7 argument. I'll use the file "dump.eth0.1059726000.pcap" from Defcon 11 here to demonstrate how to extract layer 7 payload from SMTP (TCP 25) traffic to files (one per session). This command creates 10 files with a ".bin" file extention in the output directory. Each such bin file contains the application layer data for both directions (server->client and vice versa) from an SMTP session. be in mississippi on sunday. from uspirg. he put me in contact with a whistle blower. SplitCap is FAST, really FAST! So how fast is SplitCap at splitting or filtering a pcap file? Let's do a simple benchmark and compare it to the well known tool Tshark. Again, lets use the 189 MB file "dump.eth0.1059726000.pcap" from Defcon 11 for this example. Filtering the file based on IP with Tshark takes 50 seconds (4 MB/s). Performing an equivalent filtering with SplitCap takes 3 seconds (63 MB/s). That is 16 times faster than running Tshark! Facebook announced earlier this week that they will start enabling the ability to encrypt all communication to their servers though HTTPS (i.e. HTTP over SSL). Until now it is only the login that has been encrypted, all other Facebook traffic has been sent in clear text. I suppose it was the Firesheep plugin for Firefox that forced the Facebook developers into pushing out this encryption-for-all-traffic feature. My personal opinion is that this encryption feature is something that has been needed for a long time in order to protect the privacy of all the Facebook users. By looking at network traffic from a Facebook user it has been quite simple see what email address the Facebook account is registered with as well as to extract messages that have been sent to other users. This means that anyone who has been able to sniff a user's network traffic has also been able to extract this information. 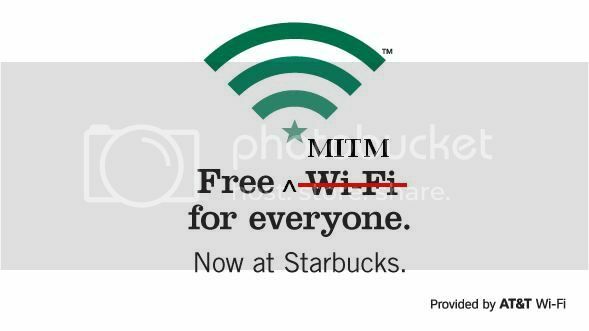 One simple way to get hold of Facebook network traffic would be to bring a laptop to the nearest coffee shop with free WiFi, Starbucks seems to be a popular choice for such activities. It is, however, not only script kiddies leeching free WiFi at Starbucks who are wanna listen in on Facebook sessions. Incident response teams as well as law enforcement utilize network forensics regularly in order to investigate computer security incidents and criminal activity. The goal of performing network forensics on Facebook traffic could be to find out who is using a particular computer or to track a botnet or worm that is running its command and control channel over Facebook. In Mandiant's recent M-trends 2011 they note that APT are starting to utilize third-party Internet services, such as Facebook, for data theft as well as command and control. The fact that Facebook are going down the SSL route therefore limits the ability of investigators to perform network forensics. There are of course way so capture network traffic even though it is encapsulated in an SSL stream. When investigating malware one can for example perform a man-in-the-middle attack by proxying all traffic trough a server controlled by the investigator. In cases when malware achieves SSL encryption by running stunnel, or some similar encryption service running on localhost, one can rely on a simple tool such as a socket proxy in order to dump the network traffic before it is encrypted. Looking inside SSL encrypted streams is unfortunately much more difficult when you don't have full access to the SSL client computer. 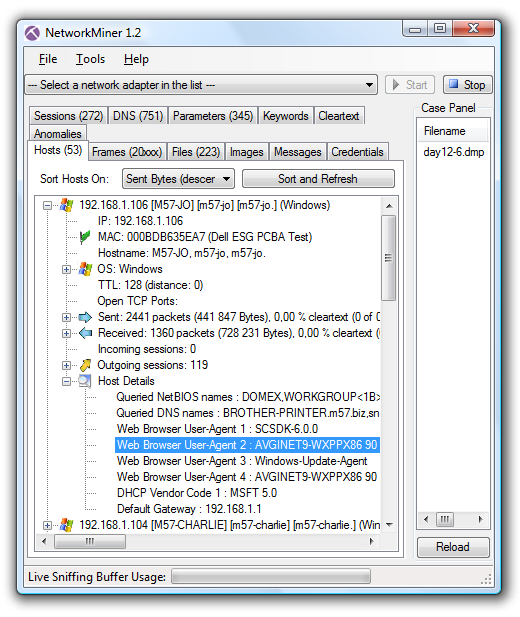 In order to decrypt SSL traffic one need to know the session key, which is typically unique for each individual session. And in order to get hold of the session key one need to be able to intercept and decode the key exchange at the beginning of the SSL session. There are multiple ways to perform the key exchange in SSL, but the most common ways are to either use RSA or to use ephemeral Diffie-Hellman key exchange. When RSA is used, and a passive listener is in possession of the server's private RSA key, one can actually decode the SSL traffic. Diffie-Hellman key exchange does, on the other hand, use a scheme where a new random private key is generated for each individual session. This prevents a third-party listener, who did not participate in the key exchange, from decoding the SSL session. 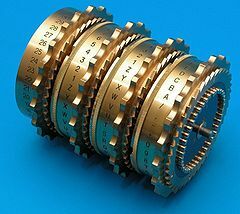 This gives the Facebook server multiple options when it comes to choosing the key exchange algorithm, including both RSA and ephemeral Diffie-Hellman (DHE). Facebook selects RSA for key exchange and RC4 for session encryption. This makes the HTTPS traffic to Facebook fairly easy to decrypt for Mark Zuckerberg, or whoever would be in possession of the private RSA key used by Facebook. By the way, here is a good YouTube video on how to enable SSL encryption on your Facebook account. 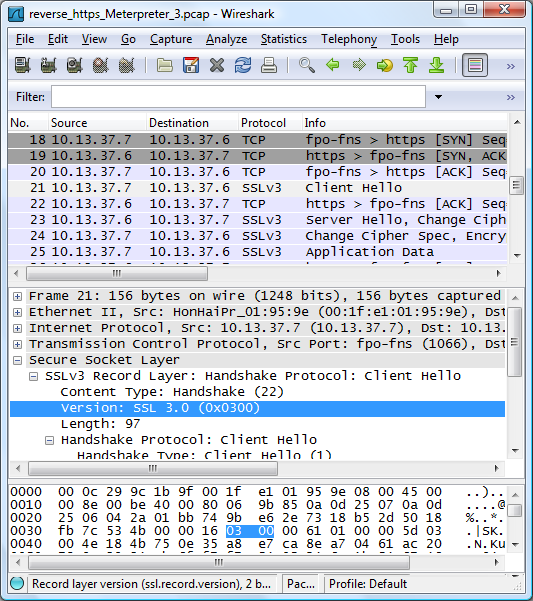 And here is a blog post that explains how to decrypt SSL traffic with Wireshark. There are many ways to capture network traffic on Windows machines. The most common way is undoubtedly to use a link-layer driver such as WinPcap's NPF-driver or Microsoft's Network Monitor driver. These drivers are typically used by applications like Wireshark and Microsoft's Network Monitor to provide low level network access, so that packets can be captured without having to pass through the TCP/IP stack. Another sniffing option is to use Raw Sockets, which can be used to capture traffic one more layer up the stack (between the Link and Internet layer). Raw Sockets is, however, a topic that I plan to cover more in detail on this blog in the future so I will not dwell any more on it in this post. What I really wanna write about in this blog post is a third way to capture network traffic: Winsock proxy capturing. 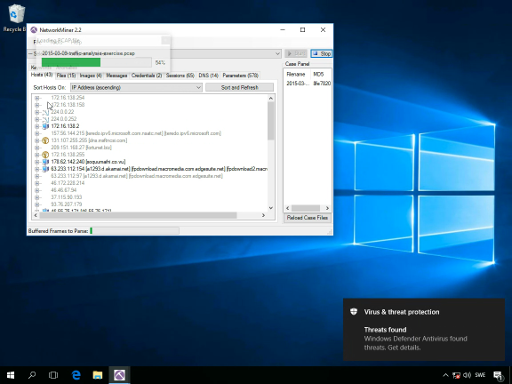 Luigi Auriemma has built a great tool called Proxocket, which can be used to capture calls between an application and the Winsock functions in Windows. Proxocket is simply two DLL files (ws2_32.dll and wsock32.dll) which should be placed in the same directory as the .exe of the application for which you wanna monitor network traffic. These DLL files act as proxies to the real Winsock DLL files (with the same names), which reside in "C:\Windows\System32\". Placing Luigi's proxy DLLs in the same folder as the .exe file causes the application to load the proxy DLLs rather than the real Winsock DLLs. Proxocket relays all packets between the application and the real Winsock DLLs, but every relayed packet is also written to a .cap file by Proxocket. Not only does Proxocket let you sniff the traffic to and from an application without having to load a new network driver or raw socket sniffing application, it also makes it possible to sniff traffic going to localhost. But why would someone wanna establish a network connection to localhost, you might ask. I have personally used localhost sockets in my applications when I have code running in different processes or threads and need an effective way for them to exchange data in an asynchronous manner (NetworkMiner does not use localhost sockets for inter-process communication though). I'm actually pretty sure many software developers use localhost sockets when they need to provide data exchange between different processes. Localhost connections are also used when running Stunnel or TOR proxies on your local machine, which encrypt all outgoing traffic. You can thereby use Proxocket in order to capture the network traffic BEFORE it is encrypted by Stunnel or TOR. I have found Proxocket very practical when I need to capture traffic from just a single application. I did, for example, use Proxocket when collecting training data for obfuscated protocols (like BitTorrent's MSE protocol and Skype) when laying the grounds for my "Breaking and Improving Protocol Obfuscation" report. By the way, Luigi is probably primarily known for being the number one vulnerability discoverer of all time according to X-Force in 2008 (I'm not sure he still holds the #1 spot though). He seems to have a special interest for finding and reporting bugs in computer games, and I do suspect Proxocket comes in quite handy when doing that type of vulnerability analysis. Richard Bejtlich published a sample lab from his TCP/IP Weapons School class two years ago. I haven't yet had the opportunity to take this class, but I have taken a look at the pcap file that Bejtlich included in this sample lab. Samantha is back with another potential security incident. She said she received another email from her friend Samuel that resulted in suspicious computer activity. She clicked on a URL but didn’t see anything interesting. Again she wonders if her computer was "hacked". I decided to load the pcap file into NetworkMiner to see what it can unveil. Sorry that last link didn't work. Here is a new cool Web page! Attached to the email is also a file called “cool_web_page.html” (see “filename” attribute in the screenshot above). This file is already reassembled and extracted to disk by NetworkMiner when it loaded the pcap file. The easiest way to locate the file is to open the “Files” tab, sort on filename and scroll down to “cool_web_page.html”. 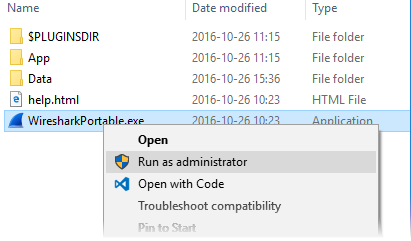 Right-clicking the file and selecting “Open folder” causes NetworkMiner to open up the folder on the computer where the file was extracted. Warning: it is almost never a good idea to select “Open file” in NetworkMiner, since that would cause the potentially malicious file to be executed. Only use this option if you are absolutely sure that the extracted file isn't malicious, or if you wanna perform behavioral analysis of the malicious code in a sandboxed environment. This sure looks fishy to me, since the image tag tells the browser to load an image from an SMB network share rather than a web server. Luckily NetworkMiner parses the SMB (a.k.a. CIFS) protocol, so any file that has been transferred over SMB will show up in the files tab. No file transfer using SMB can be seen there though. 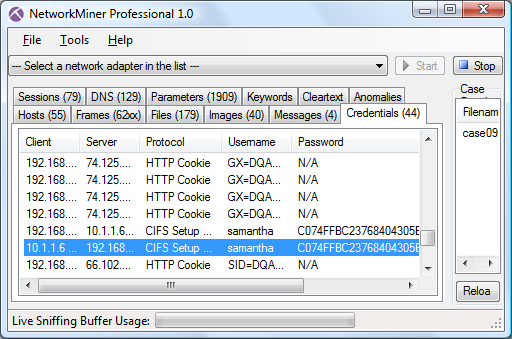 The “Sessions” tab, on the other hand, confirms that there has been SMB communication between Samantha's computer (192.168.230.4) and the suspicious machine with IP 10.1.1.6. Note: NetworkMiner displays the SMB protocol as “NetBiosSessionService”, which is the underlying protocol that provides the session layer for SMB. Interestingly enough we do not only see an SMB session from Samantha's computer to the suspicious machine, but also a second SMB session where the suspicious machine seems to connect back to Samantha's computer. This is odd, it causes me to suspect that a an SMB relay attack (MITM + pass-the-hash) could have been performed. 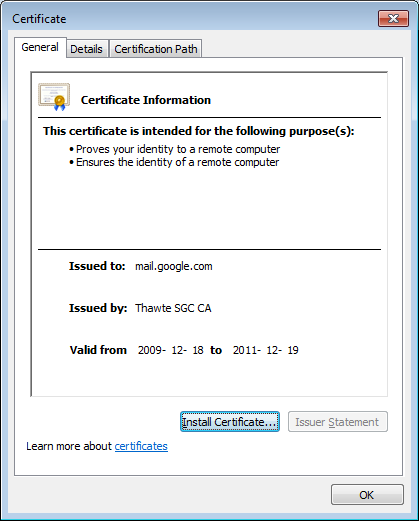 A quick look at the credentials tab verifies this suspicion, since I can see that the exact same credentials that are sent from Samantha's computer (user account “samantha” and an HMAC) are replayed by the suspicious machine back to Samantha's computer. Hence the suspicious machine is authenticating itself to Samantha's computer by using her own credentials. This is pretty much as far as I could get by only using NetworkMiner. To see what actions the attacker did after performing the pass-the-has attack one would have to look at the network traffic on a packet level (with for example Wireshark, tshark or tcpdump). Doing so will for example reveal a failed attempt at accessing the IPC$ share on Samantha's computer. This blog post could have ended here, but I also discovered some interesting excess information when analysing Bejtlich's TCP/IP Weapons School capture file. 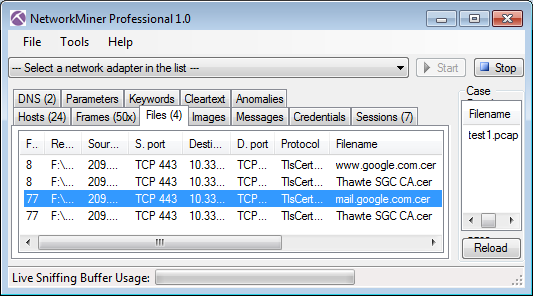 There were multiple SSL sessions in the pcap, most of them using the standard TCP 443 port. But the protocol identification functionality provided in NetworkMiner Professional also identified some SSL sessions going to servers on TCP ports 9001 and 8192. To me these SSL session look very much like TOR traffic. The encryption functionality in TOR is actually designed to mimic the TLS handshake of Firefox+Apache, but they use self signed certificates rather than certs signed with by a trusted CA. NetworkMiner extracts all certificates used in the SSL handshakes to disk, so it is easy to inspect them by looking in the files tab. Just sort the files on the Protocol column and look for “TlsCertificate” in order to quickly locate the extracted certificates. The Netresec Blog is now Online! This is the first blog post of the Netresec blog. 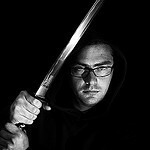 The topics that will be covered on this blog will mostly be about network security and network monitoring. Related fields like "normal" IT security, protocol design, software development and digital forensics will most likely also be touched upon at times.